Instead of trekking across ice sheets and into dangerous areas to gather data on climate change, scientists from the Georgia Institute of Technology are going to send robots in instead. 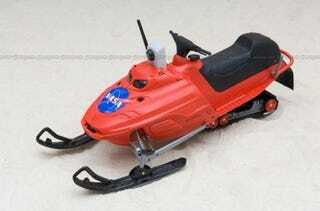 Dubbed SnoMotes, the in-development robots are modified kids snowmobiles—chosen for their cheapness and resilience—packed with navigation gear and sensors, and able to work as a team without the need for remote control. The SnoMotes will use their cameras and sensors to navigate across terrain, and they'll be able to communicate with each other to ensure they collect the necessary research data most efficiently. The trick is getting the system to work in difficult icy white-out conditions, and one possible solution is to allow the robots to "bid" on a particular destination, based on how far away they are from it, and how healthy they are, mechanically and electronically speaking.